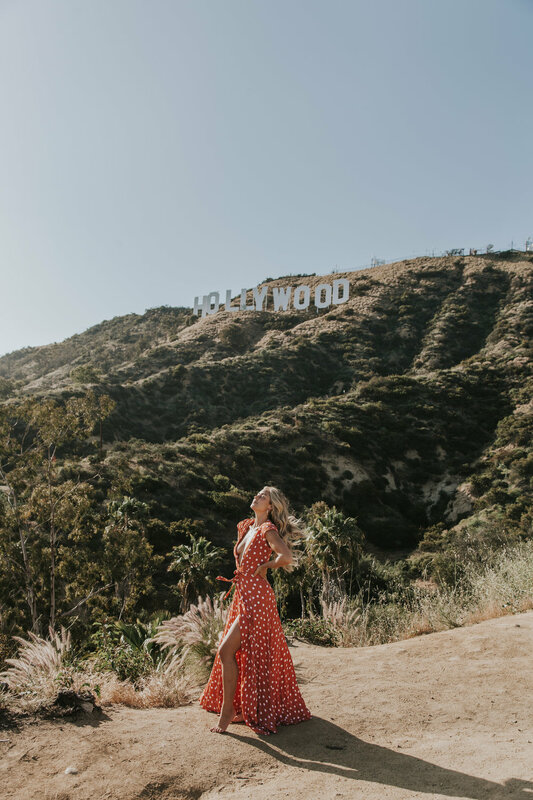 I made it to L.A for the amazing week with Revolve's #RevoveAroundTheWorld L.A~And to start it off, I headed to the Hollywood sign. You can see the Hollywood sign from so many spots, and I have climbed behind it a few times, but this is my favourite way to see it, off of Mulholland Drive...it just sort of pops up in front of you from amongst the houses, and it gives me happy shivers every time I see it because of all that it represents. The sign was put up in 1923 and originally said "HollywoodLand," and was covered in sparkling lights. The sign was actually just a marker for a new real estate development. In 1940 the sign was restored (it had deteriorated quite a bit over the years) and had the "land" removed, and became part of Griffith Park as it is today. When the sign was restored, the glitz and glamour of Hollywood (Think Marlyn Monroe and Marlon Brando) was growing as well, and Hollywood became synonymous with the style of the rich & famous - "Tinsletown" and the land where dreams come true! I am so grateful that the city of Los Angeles (along with private donors like Hugh Hefner, for one!) have taken such amazing care of the sign, and have made it an historic landmark because it is sure a cool place to visit. More coming from my week with Revolve Around the World!